A simple semi-automatic spot labeling machine suitable for running (labeling) substrate sheets, flat boxes, blanks, as well as pre-folded (RSC´s) with litho printed labels. 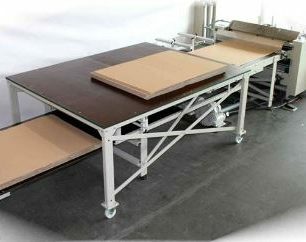 Equipped with an automatic label feeder and take-off table. The label is mounted to the lower side of the substrate sheet. Squeeze roller that presses the labelled sheets and blanks together.